I can't believe I've never noticed these before. It doesn't say new on them or anything. I'm sure I must just have missed them...right? Iunno ...but they went right in the shopping cart the second I saw them. We got home and I knew these would be our afternoon snack ...until ...I noticed the huge dent in the box. I shook the box and it sounded like pieces were rattling around ...that can't be good. Well, the packaging really does work because all 12 cones are intact, even if they are a little shaken up. What I do notice is a small problem with quality control: not a single cone matches. 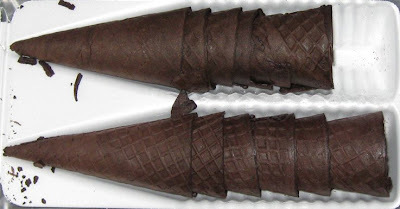 Some of them are partially smooth rather than having the typical cone surface. Others are about an inch short because the bottom looks double wrapped. It's all very odd, but they held together during preparation and that's all the matters. The taste is respectable, but not exactly what I imagined. I figured the Oreo name was just a cheezy cross marketing gimmick. Well, while the cone does not have a strong flavor, it has a distinct aftertaste that will be making you think you just had an Oreo. It's definitely different and if I was going to be scooping cones at a party, I'd be sure to keep some of these handy. My only word of caution here is that I'm not sure this will work with every flavor. I tried mine with Breyers Waffle Cone Overload and I just didn't feel like the caramel overtones were the best choice for this cone. I'm sure the Oreo cone will compliment many flavors, I just don't think this was one of them. On Second Scoop: These have been a big hit in our house, you have to try them. Quality control is rough, and I have broken a few, but overall, it's nice having these in the cabinet. I've actually been looking for these and can't seem to find them. Where did you find them at? I'm pretty sure it was Shaws (owned by SuperValu). Maybe they are hard to find since they are so tasty! that reminds me, I need to pick up some more of these.